Come face to face with one of Europe's largest collections of sharks in one of the world's longest underwater tunnels at Deep Sea World, Scotland's National Aquarium. Located beneath the world-famous Forth Rail Bridge, Deep Sea World is Scotland’s national aquarium. Over 40 displays, including the 4.5-million-litre Underwater Safari with its walkthrough tunnel, are home to hundreds of fascinating creatures, ranging from seals and seahorses to stingrays and giant sand tiger sharks. 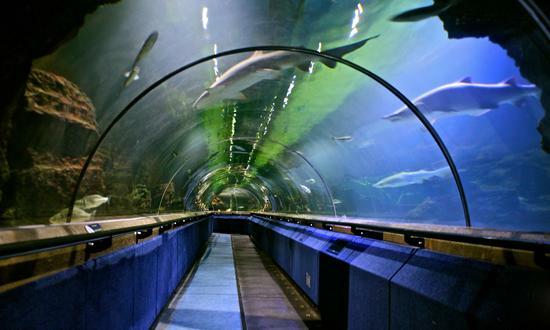 Discover the mysteries of the deep with a huge selection of creatures to gaze at in the amazing underwater tunnel. At 112 m long, it holds a million gallons of sea water, making it the largest temperate marine exhibit in the UK and one of the longest underwater safaris in the world. See the piranhas and resident seals. Or for something more adventurous, Why not go diving with the sharks?